Another Upcoming Meeting & Lots of New & Exciting News! 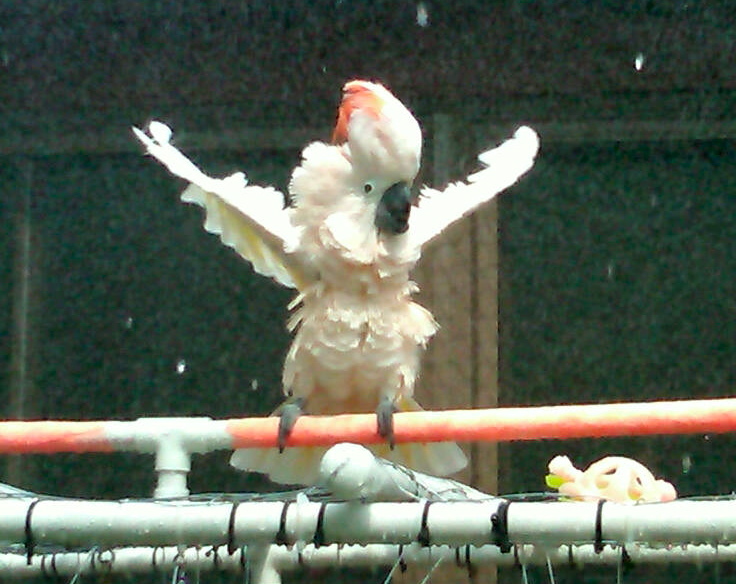 Rocky, the Moluccan Cockatoo, excitedly showering in the aviary. Hello everyone! We hope everyone is enjoying their summer and what looks like the end of it. I’ve noticed the leaves already starting to turn. We wanted to send out a quick reminder to let everyone know our next meeting is this coming Monday, September 13th at the Sanger Branch Library at 6:15. We have a lot to discuss and also discuss our topic of “Easy Enrichment Ideas for the Busy Parrot Owner.” If you can, think of a few quick and easy ideas as far as enrichment that you provide to your parrot and that you can share with the group. We have many and can’t wait to share and can’t wait to hear other ideas. This could be good for all in many, many ways and you never know when you’ll pull some of these ideas out for yourself. We have some developmental news we’d like to share at the next meeting. Also, we are continuing to get phone calls from people interested in attending our meetings. This is exciting and something we will expect to continue. We strive to provide an educational and fun meeting spot once a month that is free to the public. This is all based around an avenue to provide the happy living of us with our companion parrots and our companions with ourselves. We also have scheduled an guest speaker and have been in touch with a few others. Things are really taking shape. We’ll see you Monday night.